British Foreign Secretary William Hague said Sunday there is no deadline for NATO’s Libya operation, as Russia voiced concerns that the use of helicopters showed it was sliding towards a land campaign. As British Apache choppers attacked forces loyal to Libyan leader Muammar Qaddafi for a second night, Hague admitted the nearly three-month-old mission was “intensifying” but denied any “mission creep”. “We’re not going to set a deadline. You’re asking about Christmas and who knows, it could be days or weeks or months, (but) it is worth doing,” Mr. Hague told an interviewer on BBC television. The use of helicopters significantly ramped up NATO’s operations and was a major boost to Libyan rebels, just a day after the fighters forced government troops from three western towns and broke the siege of a fourth. It was yet another erosion of Colonel Qaddafi’s power since the eruption in mid-February of the uprising to end his rule. Until now, NATO has relied on attack jets, generally flying above 15,000 feet (4,500 meters) – nearly three miles (five kilometers) high. The jets primarily strike government targets but there have been cases where they missed and hit rebels instead. The helicopters give the alliance a key advantage in close-up combat, flying at much lower altitudes. Mr. Hague, who held talks with Libyan rebel leaders in their stronghold Benghazi on Saturday, ruled out putting ground forces, saying NATO would stick to the terms of a UN Security Council resolution passed in March to protect civilians. “We will continue in that way, intensifying what we’re doing — the Apache helicopters are an example of that — but that’s different from mission creep,” the foreign secretary said..
His comments came as the defense ministry said British Apaches based on HMS Ocean off the north African coast had destroyed a multiple rocket launcher near the eastern Libyan oil hub of Brega on Saturday. British Tornado strike planes separately joined other NATO aircraft in a major strike in Tripoli. 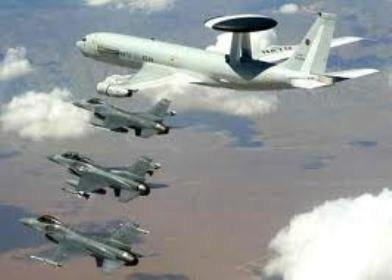 Moscow, which is calling for a negotiated solution to the conflict, expressed alarm on Saturday and Foreign Minister Sergei Lavrov said the decision to use helicopters was “deplorable” and that NATO is “one step” from sending troops into Libya. “We consider that what is going on is either consciously or unconsciously sliding towards a land operation,” Mr. Lavrov said. The head of the rebels’ Transitional National Council, Mustafa Abdul-Jalil, however welcomed the helicopter attacks and emphasized that they launched from ships outside Libya. “We welcome any measures to expedite the departure of Muammar Qaddafi, but at the same time we maintain the sovereignty of the Libyan state,” Mr. Abdul-Jalil told reporters Saturday. The conflict in Libya appears at a stalemate after nearly four months. NATO airstrikes have kept the outgunned rebels from being overrun, but the rebels have been unable to mount an effective offensive against Colonel Qaddafi’s better equipped forces. Colonel Qaddafi’s regime has been slowly crumbling from within. A significant number of officers and several Cabinet ministers have defected, and most have expressed support for the opposition, but Colonel Qaddafi’s hold on power shows little sign of loosening. Colonel Qaddafi has been seen in public rarely and heard even less frequently since a NATO airstrike on his compound killed one of his sons on April 30. Questions are arising about the physical and mental state of the 69-year-old dictator, who has ruled Libya since 1969.